Scheer’s selfless answer stems from his volunteer work as chief pilot for Children’s Flight of Hope, a nonprofit organization with eight pilots who donate their time and skills to fly children in need to hospitals within a 600-mile radius of Raleigh-Durham International Airport. “What they do is really amazing. There have been times when I’ve seen the kids here and I’ve just wondered how George does it. He has a heart of gold,” stated Cheri Swanson, who works at Sanford-Lee County Regional Airport, where the Children’s Flight of Hope aircraft is kept. The Cessna 414A is a classic small airplane that seats seven passengers and has room for family members to fly with the children. In most cases, these children have orthopedic problems, have been diagnosed with cancer or are burn victims. Many of the flights are made to the Cincinnati Shriners Hospital for Children, which has a burn center that is verified by the American College of Surgeons and the American Burn Association. Because Shriners Hospitals provide medical care at no cost for eligible families, Children’s Flight of Hope makes the entire process free. This year, Children’s Flight of Hope will have been on about 50 missions to help children who cannot afford medical care or who cannot travel any other way because of their medical conditions. “Our ultimate goal is to help as many families as possible get the medical care they need for their children when it isn’t available to them locally for whatever reason,” Scheer said. Scheer heard of the organization in the mid ’90s from some of his fellow pilots while he was a broadcast journalist for WUNC radio. Scheer wanted to be involved from the day he heard of Children’s Flight of Hope, but his radio hours were not compatible with Flight of Hope. Some of the missions require pilots to stay overnight with the plane or to stay later than expected because of the way the children react to the treatments, “It just wasn’t going to work. I had to be on the radio at 10 every night,” Scheer explained. 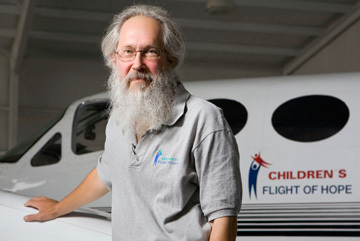 As soon as his 25-year broadcast career ended in 2004, Scheer began flying with Children’s Flight of hope, and he now completes about one mission a week. “I can’t remember a time when I didn’t want to fly a plane,” he stated. Not only is Scheer helping these families in need, but he is also doing what he loves, which makes the job more than just volunteer work and a way to put his hobby to good use. As much as Scheer loves flying, his favorite part isn’t sitting in the cockpit; it’s getting to know the families. “They work hard to educate themselves about the disease their child has. They research, talk to doctors, read about trials and medical treatments, and even hold bake sales to raise money. They move heaven and earth to keep their children alive. It’s awe-inspiring to watch,” he stated. Having 6-year-old twins of his own, Scheer understands the meaning of his work on a deeper level. “You see what the families go through and what they endure and then go home and look at your own kids and can’t help but be thankful they are healthy. It’s cliché to say, but it puts a lot of things in life in perspective,” he explained. Although the economy has taken a toll on the organization this year, Scheer still has faith that it will grow. “I hope one day we can be of service to families in different parts of the country and maybe afford a jet to take kids anywhere. The board does such a great job of raising the money, and without them, we wouldn’t function,” he said. For more information, visit www.childrensflightofhope.org.